Front row (left to right): 1. unidentified, 2. unidentified, 3. unidentified, 4. unidentified, 5. unidentified, 6. Tom Reitz, 7. Russell Johnson, 8. unidentified, 9. unidentified, 10. unidentified. Second row: 1. Beverley Spears, 2. Janet Meyers, 3. unidentified, 4. unidentified, 5. unidentified, 6. Pam Lamfers, 7. unidentified, 8. Carol Cragholm, 9. unidentified, 10. unidentified. Third row: 1. unidentified, 2. unidentified, 3. Dan Dailey, 4. unidentified, 5. unidentified, 6. Nita Kinney, 7. unidentified, 8. Robert Bar, 9. unidentified. Standing behind the third row: unidentified teacher. Credits: From the collection of Tom Reitz. Scanned by Brian McFann. Thanks to Tom Reitz and Robert Mills for identifying the kids in the picture. The kids in the picture are members of the high school graduation class of 1966. 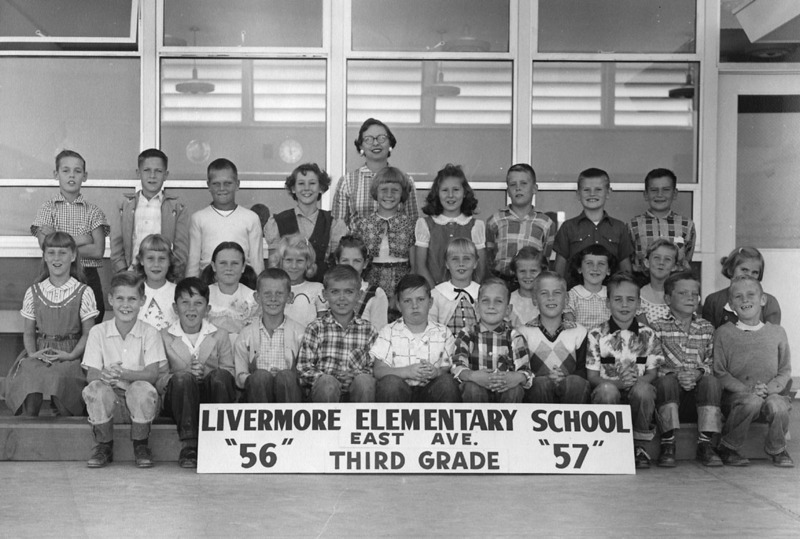 To find other pictures of the class of 1966 in the archive, see Livermore class pictures listed by year of high school graduation: 1966. And if you have any pictures of the class of 1966 that you would like to share, please submit them to the Archive.